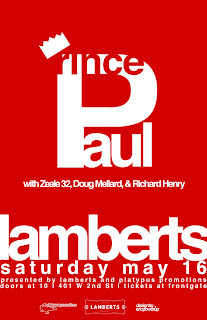 From the hooray tax refund check department... First to email me @ emptyonline @ gmail.com gets a pair of tickets to Prince Paul @ Lambert's on May 26th! Zeale 32, Doug Mellard and Richard Henry also holding it down! Originally a member of Stetsasonic, he produced tracks on hip-hop albums such as 3rd Bass' 1989 debut album The Cactus Album and De La Soul's first three albums. After which he put together two solo albums: Psychoanalysis: What is It? and the hip hop opera A Prince Among Thieves, which featured Big Daddy Kane, Xzibit, Kool Keith and Everlast. He, along with Frukwan of Stetsasonic, Too Poetic of Brothers Grimm, and The RZA of Wu-Tang Clan, made up the Gravediggaz. In the liner notes of De La Soul's 1993 album Buhloone Mindstate, Paul hinted at his future projects with the Gravediggaz: "I would like to thank all my friends and business cohorts who dissed me, played me, and jerked me when times were hard. For you made me wiser, stronger, crazier, and, most of all, a Gravedigga!"